Purification of the soul, in reality, is the result of sound application of the Sacred Law and the following of the Messenger of Allah, blessings and peace be upon him. 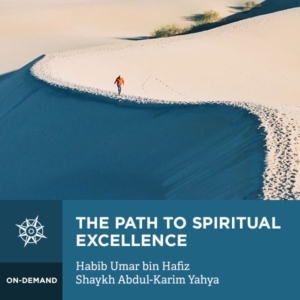 This lesson set is an explanation of the spiritual path starting with the presence of Allah in daily activities, and with the blessings attached to seeking Sacred Knowledge. It represents a summary of the teacher’s experience of the spiritual path. This is some of the beautiful wisdom shares by Habib ʿUmar bin Hafiz in this important lesson set. He explains what the path to Allah is, and discusses the means and practices needed to get closer to Allah. The course also discusses the faults the human ego has, and the means of removing them, starting with taking stock of oneself and one’s state, and turning to Allah. Allah is found with those who are broken hearted for His sake. These lessons are taught in Arabic and translated into English by Shaykh Abdul-Karim Yahya. This makes this course perfect for those wanting to refine their soul to draw closer to Allah, and those who want to improve their Arabic skills in the process.